i found this transaction today "https://horizon.stellar.org/operations/95313531980759041"
Now i don't find my XLM, what does it mean ? Hi, I saw but i guess i can't do anything ? So, what is really a problem? Can anyone explain please? I'm just a rookie here. Help my xml are not delivering to my wallet. How do I retrieve them from the ledger? I am having the same problem. 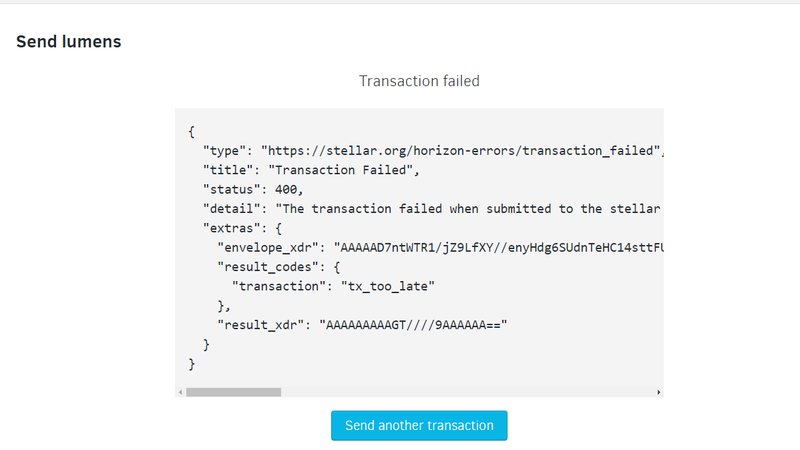 Yesterday I tried to send XLM from my wallet to an exchange and it didn't work. So, I tried again last night, still didn't work. Something is going on with Stellar wallet. I just check my Binance wallet, and nothing came through. Can someone from the Admin group or helpdesk please respond. What is going on with Stellar wallet?? I have been having the same issue for over a week now, cannot TX any xlm from the account viewer with my nano s.. The TX fails every time and shows a "status error - 400" ... It sure would be nice if there was an actual support for the account viewer..
Has anybody gotten this resolved? Still just crickets from Admin? You do realise that I don't work for Stellar? No, I still have this same issue for 2 weeks now.. Ledger support says to come here but yet stellar has no support other than this forum and you get replies like above "I dont work for Stellar"... Absolutely ridiculous. This right here is a perfect example of why mass adoption will be a long slow process if ever..
@Geoscash1 To be clear, I was replying to the comment made above mine saying "Still just crickets from Admin?". I understand your frustration and don't blame you at all but I'm just a random stellar user like yourself. My apologies Admin, I should have said "from Stellar Support". Though it appears to my newbie eyes that Stellar seems to have dropped that in your lap. This is all a revelation to me, and not really an encouraging one. FWIW, I haven't tried sending any XLM to an exchange, but I did a quick test yesterday by sending 20 XLM from my Ledger Nano S with Stellar Account Viewer to my desktop Stargazer wallet, and then back. The transactions were nearly instantaneous in each direction. @Geoscash1 what stellar client do you use? Can you access your secret key? I'm no expert but error 400 could roughly mean the transaction is in bad format. Just guessing here but could be that your client is outdated and cannot form valid transaction for current ledger. I use the stellar account viewer on chrome with my ledger. But after much research and ideas from SM and youtube I downloaded opera and brave and tried with both of them and it does the same thing giving the 400 error with failed tx. Same as in the image i posted above. my system is updated, my ledger is updated to the new 5.5 and since chrome no longer supports the addon apps I downloaded the ledger live and now use it. I followed all of the proper procedures for the ledger update, Remove apps first, then reinstall them. etc etc. I can get everything pen and logged in but the stellar account viewer just wont let me send the xlm out. So I really have no idea what the issue is or how to fix it. geebee92, sorry, wasnt trying to hijack your thread, I just signed up and was trying to find similar issues and found yours and posted here.